This street scene watercolor painting is based on a photo I took a few years ago when visiting Melbourne in Victoria, Australia. 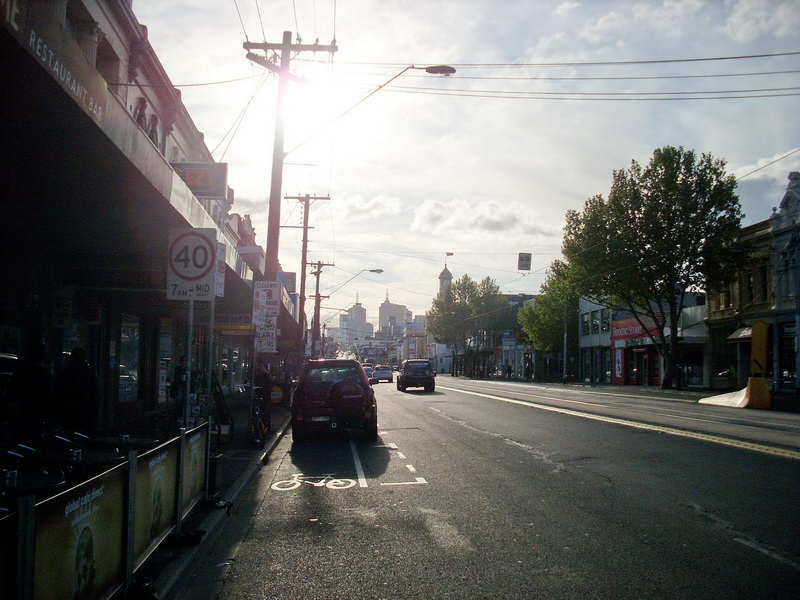 It is a lovely city with well designed roads, tree lined streets, trams and tram lines, old buildings. I have painted Bridge Road in Richmond many times from different positions and times of the day. Brushes: Sizes 24 and 16 for larger washes and 12 and 10 for the smaller areas and detail. Rigger to paint in the power lines. Paints: All Winsor and Newton – Cobalt Blue, Cadmium Orange, French Ultramarine, Burnt Sienna, Alizarin Crimson are the main colors. Backing board, masking tape, old towel to control wetness of your brushes. Do a detailed drawing of this scene. The key to doing street scenes like this is to start with eye level and then build the rest of the scene from there. What I mean by this is that if you put in eye level that effectively tells you where the horizon would be if you had one and hence where the general vanishing point for your street would be (obviously this would be a lot more complicated if this was a hilly scene but that will have to wait till a later demonstration). Draw a line across the sheet at eye level and then adjust everything from there. Start by drawing a person, in this case the one on the bottom left hand side of the painting. Then draw the car near him. Think about the proportions of the car to the man, the man to the awning above in etc, when doing the drawing. In this way everything should look like it fits together. 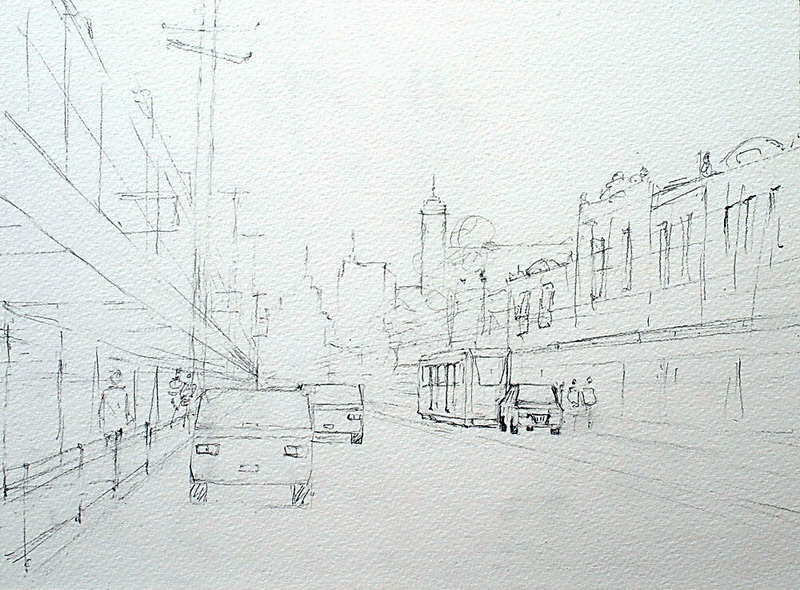 I will be doing a future demonstration on just how to draw a street scene. Notice in the drawing below that I made adjustments I felt added to the overall design of the image e.g. I put in the tram and car on the other side of the road and made the road a little narrower. I removed some of the trees on the right hand side and simplified the buildings there. When I do a painting like this I do not stick completely to what is in the photograph or the scene in front of me when painting from life. If I want an image with everything in it as is then I might as well just frame my photograph. Instead I make adjustments which I feel will give the message I want to convey with a minimum of brush strokes and drawing. In this case I wanted to show the sunset with people no doubt on their way home after a days work!